which will contextually target advertising onto mobile site content. According to the search giant, the ads will provide a new source of revenue for mobile publishers, as well as giving an incentive for exisiting websites to produce mobile versions. Google’s Dilip Venkatachari told the New York Times that it would encourage mobile publishers to limit the number of ads to two per page, to avoid spoiling the user experience. As with standard Adsense/Adwords ads, Adsense Mobile text ads will run on an auction model. The service will be available for publishers in the US, England, France, Italy, Germany, Spain, Ireland, Russia, Netherlands, Australia, India, China and Japan. Google’s entry into the mobile ad market has been expected for some time – AdMob, which runs a similar system to Adsense, has been pretty successful so far, serving a billion mobile ads in its first year. 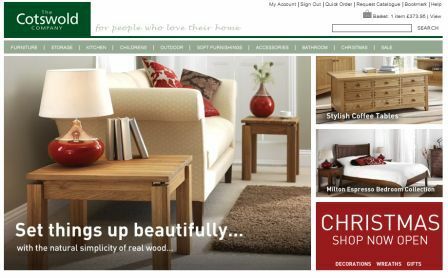 The Cotswold Company launched a revamped version of its e-commerce website this week, with improved navigation and an easier to use checkout function. Bob Chieffo published an excellent article last week on the importance of buttons on e-commerce sites in making it clear to the customer what they need to press next. He points out, on Revenews, that many etailers allow too much room for confusion in the mind of the customer over what they need to do and press to make their purchase. 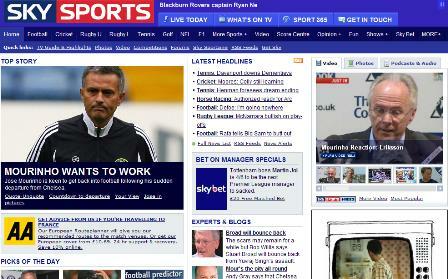 Sky Sports redesign – has it affected usability? Sky launched a new version of its Sky Sports website last month, adding a range of blogs and podcasts, and redesigning the website’s navigation. The new site design certainly looks good, but has the site’s usability suffered, as this article suggests?